The Ai Tracker X is the ultimate tool for plane spotting in FSX or P3D. It offers multiple observation modes and perspectives, formation flight and recording&playback functions. Follow AI using an invisible camera pod. Watch them right on their tail, in pilot view, from a fixed position or in a flyby depiction mode. Fly formation with the AI in detached mode or just observe them flying formation with each other. Create AI flights with every aircraft in your hangar (or any other sim object), using a standard FS compatible flight plan. The AiTrackerX is not limited to AI models! Got a shiny new payware addon airplane? Just dispatch it as AI and observe it going through a flightplan. Or create one flying formation with you at any time, so you can study it from the cockpit while you fly. Create AI movement with every sim object in your library, by simply importing a standard FS compatible flight plan. Create AI at an airport that will take off and intercept you or other AI. 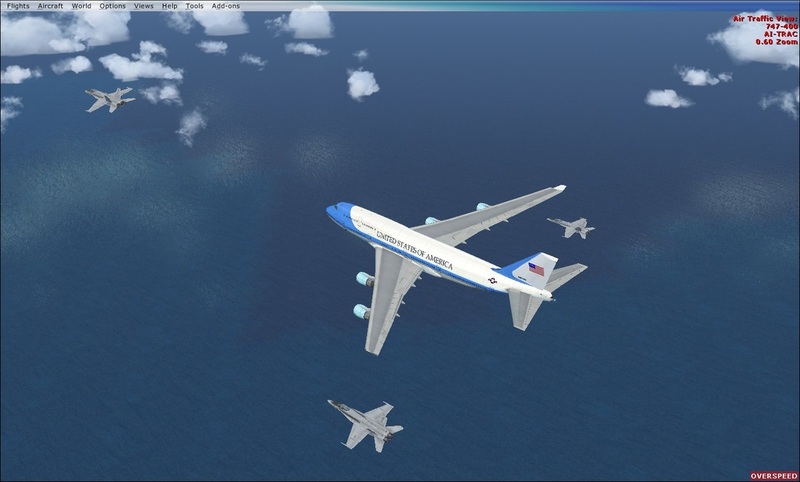 Build large formations of aircraft with just a few mouseclicks. Sit back in your virtual cockpit and let the AI "drive" you through the whole flight in pilot view mode. Record your flight in two different modes. Playback your flight using any aircraft model. Includes a cross platform multiplayer solution to fly together while sharing your AI formations with your friends.